Hurricane Florence's impacts on North Carolina were our main weather stories in September. This climate summary looks at the heavy rainfall, an early damage assessment, as well as our warm weather over the past month. 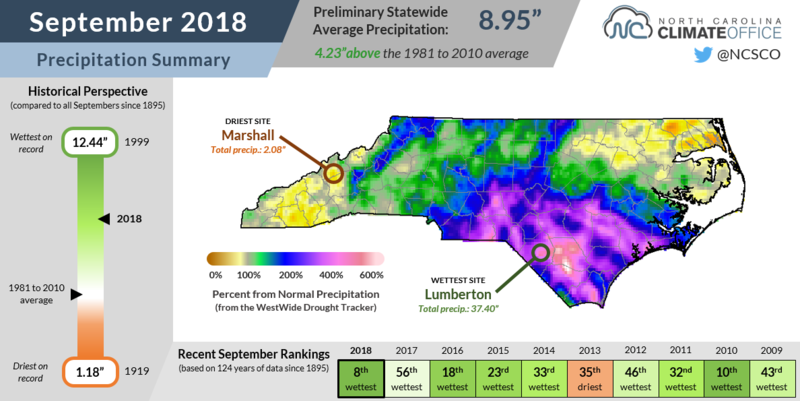 We've already detailed the record-breaking rainfall from Hurricane Florence, and even with two dry weeks after the storm, September still finished among our wettest ever. The preliminary statewide average precipitation of 8.95 inches ranks as our 8th-wettest September in the past 124 years. That puts 2018 in good company among some memorably wet months. Among the seven wetter Septembers since 1895, all but one included rainfall from one or more tropical systems. Those include our wettest September on record from 1999 with rain from Dennis and Floyd, September 2004 that saw the remnants of Ivan and Jeanne move through, and September 1996 when Fran was the feature story. Several weather stations in the southern Coastal Plain recorded their wettest September, or even their wettest month. The Wilmington Airport reported a monthly total of 24.13 inches, or 42% of their normal annual total precipitation. This was wetter than every other month dating back to 1871, topping the 23.41 inches during September 1999. Several other southern Coastal Plain stations also had record wet months with more than 20 inches of rain. Both Lumberton (37.40 inches) and Whiteville (23.31 inches) surpassed their September 1999 totals, and Laurinburg measured 20.72 inches of rain to shatter its previous greatest monthly rainfall amount of 14.82 inches from July 1965. Farther west, Monroe measured 12.77 inches of rain last month in its 2nd-wettest September since 1896. While that part of the southern Piedmont slipped into Moderate Drought conditions in early September, Florence effectively turned a 4-inch deficit over the past 6 months into a 7-inch surplus, washing away any drought concerns in North Carolina. US Drought Monitor maps for North Carolina on September 4 (left) and September 25 (right). Florence's impacts were varied, far-reaching, and, like the storm itself, didn't go away overnight. The flooding along the Cape Fear, Neuse, Lumber, and Trent rivers in eastern North Carolina has been especially slow to recede, and in some areas, it got worse before it got better. In the week after the storm, some of the rain that fell over western NC -- including Mount Mitchell's new daily record of 14.06 inches -- took up to a week to work its way down to the coast, leading to a second surge of water downstream. While at one point, more than a dozen river gauges had reached major flood stage in North Carolina, just one site in the southern Coastal Plain -- along the Lumber River in Lumberton -- remains above the minor flood stage. 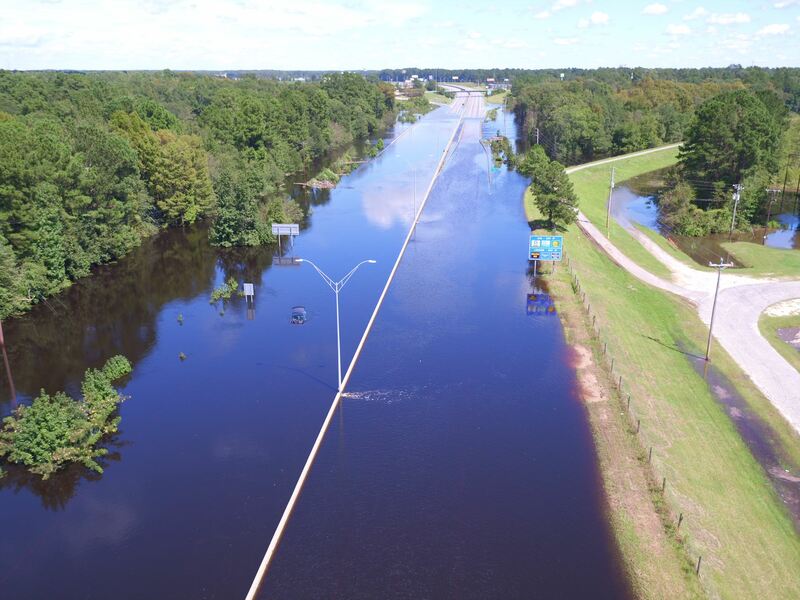 Flooded sections of interstate 40 and 95 finally opened late in the month and some of the hardest-hit cities and towns are accessible once again, but the initial assessments from those areas show just how hard Florence hit. New Bern has estimated $100 million in combined residential and commercial damage from the storm, including more than 4,300 homes and 300 businesses damaged or destroyed. The agriculture industry also suffered significant damage from the storm. Crop progress reports indicate that 50 to 100 percent of the unharvested tobacco crop in the northern and central Piedmont, and between sitting in wet fields and being whipped by strong wind gusts, much of the remaining corn and cotton crops may also be unsalvageable. Across the state, the NC Division of Public Safety has confirmed 39 storm-related fatalities, including eight in Duplin County. They also report 5,214 people and 1,067 animals were rescued during the storm. Since the storm, the National Weather Service has confirmed 16 tornadoes associated with Florence that touched down in North Carolina and 28 total from the storm. No injuries or fatalities in North Carolina have been attributed to those tornadoes, the most severe of which reached EF-1 classification. Our steamy summer spilled over into September to bring an unseasonable start to the fall. The preliminary statewide average temperature of 75.3°F ranked as our 3rd-warmest September on record. We haven't seen a September that warm in almost a century; our only two warmer Septembers were in 1921 and 1925! 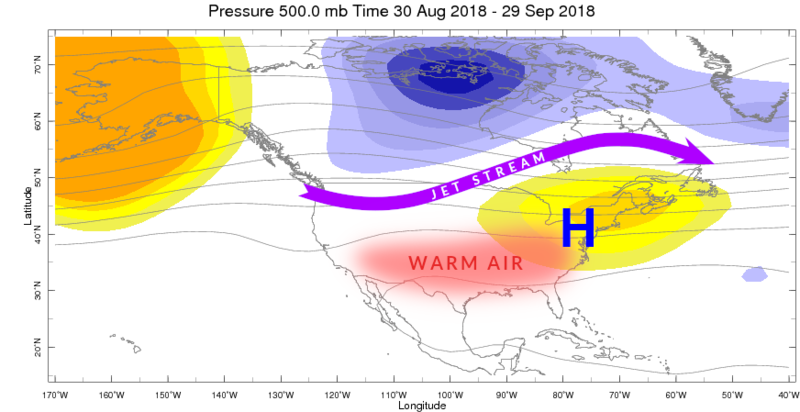 Persistent upper-level ridging over the eastern US kept above-normal temperatures in place, and cloudy, humid overnight conditions helped elevate our low temperatures even further. Our maximum temperatures were generally 3 to 6 degrees above normal, on average, but we really saw the warmth in our nighttime lows. Minimum temperatures averaged 7 to 10 degrees above normal and ranked as the warmest ever in September for almost the entire state. Mean temperatures also came out well above normal, including as the warmest September on record at a number of sites including Hatteras, Elizabeth City, and Asheville. You may see the effects of those temperatures on the trees this month, as the leaf color emergence has been effectively delayed by the recent warmth. "This year, the trees seem greener than ever this far into the season," said Dr. Howard Neufeld, a biology professor at Appalachian State and the author of the Fall Color Report page. "Usually, the last week of September and early October are the peak color season for the highest elevations, but the trees, with few exceptions, are still mostly green." Especially in the Mountains, the warm overnight lows may be mostly to blame. 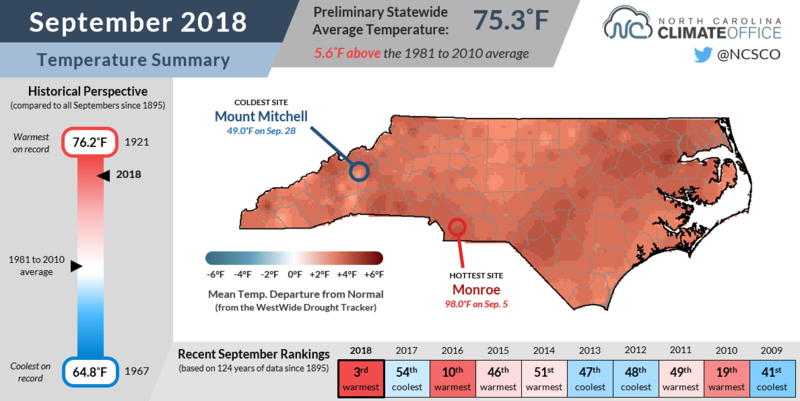 In Asheville, the average low temperature in September of 65.9°F was more than 3 degrees warmer than the next-warmest September (62.8°F in 1926), and almost 5 degrees greater than the next-warmest recent September (61.1°F in 2014). 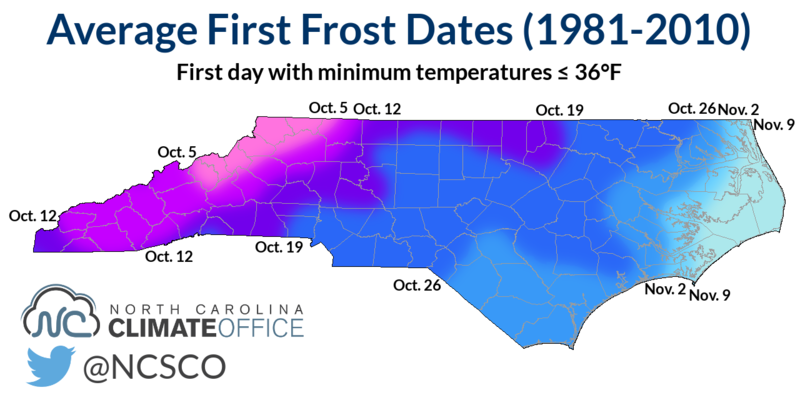 While we do tend to see our first frost across much of the state during October, the forecast for another month of above-normal temperatures, on average, could also mean we have to wait a little longer to get that first taste of fall.